Since it’s been a year since Lauren (Alexis) Wood’s last book was released and she was featured in my Author Spotlight, I thought I’d check in to see how her book marketing has progressed. Lauren has a new book possibly being released later in 2018, Prone to Pronoia, a collection of comedic essays. Learn more about Lauren at www.laurenalexiswood.com, facebook.com/laurenalexiswood, @laurenalexiswood (Instagram), @laurenalexswood (Twitter), facebook.com/paradisiacpublishing, @paradisiac.publishing (Instagram), @paradisiacpub (Twitter), www.facebook.com/goldcoastalmanac, @goldcoastalmanac (Instagram), and @goldcoastalmanaccomedy (Instagram). Something’s Missing: A children’s book about a family welcoming a new baby that I wrote as a baby shower gift to my brother and sister-in-law when they welcomed my niece into this world last fall. Help Me! I’m Fat! : It is both poking fun at the prevalence of Christianity in the fitness community while promoting body positivity in the same way you’d expect to be encouraged by a very emotionally distant relative. It also just so happens to be an interactive, handy-dandy weight loss journal! Prone to Pronoia: A collection of comedic essays, to be published later this year (2018) or maybe early next year (2019). Last weekend I gave a presentation on branding at the Davenport (Iowa) Public Library’s first Indie Author Day. As is smart to do with any content, I thought I’d repurpose a bit of it into a blog post. When working with branding for book marketing, there are essentially three steps to follow. Whether you like it or not, people are going to form opinions about you and your writing, thereby defining your brand. So why not do your best to steer those opinions? In addition to considering your genre, writing style, voice, etc. in defining your brand, think also about other aspects of your personality, outside interests, and goals. Incorporate your reader as well, deciding what benefit you’d like him or her to get from your books. If you’re a genre hopper, think about focusing more on the “author” part of the author brand or incorporating a common theme or element throughout your books, such as a hobby, emotion, or setting. Steps two and three are very similar, but I think of building brand awareness more as being your brand. Behave and make choices about how you conduct your business, marketing, and life in accordance with your brand. As an indie author, readers will often encounter you before your books, so make sure they know what to expect. The last thing you want is for them to expect one thing from interacting with you at an event, buy your book, be disappointed, and leave a negative review. Part of this step is also choosing those style elements that symbolize your brand: colors, logo, font, graphics, etc. that you use on everything that represents you and your brand. You also build brand awareness through step number three, promoting your brand. When you are promoting your book, you are also promoting your brand. You can promote your brand through content marketing with the book itself (cover, typeset, etc. ), website, social media, blogging, business cards, bookmarks, etc. You can promote your brand more personally with appearances, book signings, readings, and author fairs. Whatever you do with your author brand, make sure that you are doing your best to drive it where you want it to go instead of leaving it up to chance. Little by little, you will create the brand you desire. Do you have any questions or ideas on author branding? If so, please share in the comment section. Have you heard that you should be giving something away for free so that readers will give you their email addresses, but you’re not sure what to give? You don’t want to proverbially let them milk the cow for free without ever buying it. Or maybe you only have one book so far or don’t have a series, so you can’t let the first edition go for free. How do you decide what to give away to help ensure that the people who subscribe will be the ones most likely to buy your book? If you had these thoughts or questions, you’re not alone. Here’s my take on the subject. I look at reader magnet freebies like I do free samples at the grocery store. Let’s say there’s a new faux noodle out that claims it tastes just like real, white pasta with the same nutritional value as whole grain varieties, but contains a fraction of the calories. (If we’re going to dream, might as well dream big.) I’ve had the tofu noodles and used zucchini in my spiralizer. So I’m skeptical. Luckily, the grocery store is giving out free samples of the new miracle noodle today. I try it. Then, I either decide it’s just another trick and pass, or their claims are actually true, so I stock up. Try to look at your writing the same way. A reader sees your book, and it looks promising, but they aren’t sure. They’ve never heard of you and they’ve fallen for this before. Offering them a free sample will help them decide if they want to buy or pass. If you have just one book, I recommend giving away a short story you’ve written in the same genre or at least one as similar to your book as possible. If you’re not a short story writer, you can give away the first few chapters. However, make sure you’re clear that they are just the first chapters and not the entire book so you don’t anger them. Once you have more than one book, seriously consider giving the first book away for free as your reader magnet, especially if it’s the first in a series or in the same genre. Even if it isn’t, it will still give the reader an idea of your writing style. Above all, when deciding on the freebie to offer in book marketing, think “free sample.” What can you provide that will give a potential reader a good idea of your writing style, story telling ability, etc? Especially if you’re in the early stages of your author career, think of the this as more of a long time process. If they get your freebie and like it, they are more likely to buy your next title(s) when you send them that email telling them it’s available. When I surveyed a group of authors late last year, the number one thing respondents said was holding them back (a full third) was getting started in planning their book marketing. So I’ve created a mini-course guiding you through three simple things you can do to start planning your book marketing. Ready to take the course? Go here to sign up. 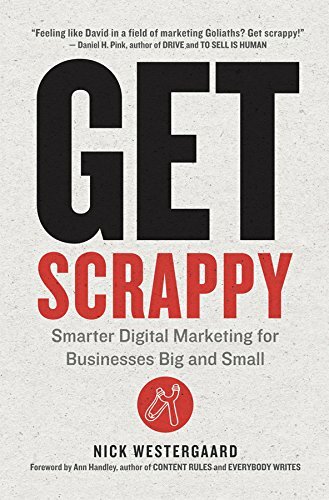 Get Scrappy: Smarter Digital Marketing for Businesses Big and Small by Nick Westergaard is directly applicable to book marketing. What’s a smaller business than an author trying to sell his or her books? Often authors have a pretty good handle on talking to bookstores and libraries, getting appearances, holding signings, etc.. They may have varying degrees of success, but they at least know the concept well. However, they are often at a loss of how best to market their books online. Get Scrappy will not give you specific tactics on how to market your books online, but it will give you actionable steps about how-to clarify your overall strategy and goals in that effort. Though all three of the book’s sections can be applied to book marketing, I happened to have my most “aha” moments while reading the first section: “Smart Steps You Can’t Skip.” It helps you get into a healthy mindset and think about the foundation of marketing and your goals; particularly, your brand’s goals. It then offers a way, using the classic, who, what, when, where, etc. to create your “marketing map,” helping you decide on which objective you should focus. If your objective is market research for writing your books, you can ask questions of your readers, having them vote on the next book cover or a subplot they’d like to see incorporated. Knowing why you’re using digital to market your book (objective) and knowing who you’re trying to reach (readers), will help you decide what to do to market your book. The end of part one gives the basics of the current and most-used online marketing platforms. Nick purposely doesn’t explain how all of the available platforms work to reinforce his advice of avoiding being distracted by “shiny new things” As in other industries, there are always these shiny new things popping up to help you market your books. Chapter three helps you decide which shiny new thing to try and which to let go, giving you a framework for evaluating shiny new things that may pop up after Get Scrappy’s publication. Part two provides advice to help you do more with less. As an author with a likely tiny marketing budgeting, doing more with less is essential. This naturally leads into part three which helps you decide how to do more with less by simplifying your efforts, including by connecting your online marketing to your offline. Get Scrappy is more than just a book to read, it’s more of a marketing movement, a new way to approach marketing. It’s essentially a new way to think about marketing, including book marketing. Source: Westergaard, Nick. Get Scrappy. (2016).American Management Association. New York. Though I don’t recommend blindly copying what other authors are doing to market their books, because there is no one-size-fits-all, magic-bullet book marketing solution, and what works for one author or book, might not work for you or yours, I do recommend keeping updated on what other authors are doing and borrowing those ideas that make sense. Mentors are important in almost everything we do, but most of us can’t afford to hire one, and those that we really admire are likely beyond our reach. (Could you imagine the answer if you contacted Stephen King and asked him to be your mentor?) Luckily, though, with today’s technology, you can be mentored (at least to a degree) by anyone you want. And you don’t need their permission, and they don’t even have to know they’re mentoring you. Gabriela Pereira discusses this notion of a “virtual mentor” in her book, diyMFA. To apply it to finding a marketing mentor, simply find an author you admire, study their websites, subscribe to their newsletters, and follow them on all of their social media outlets. Try to choose mentors who have books similar to or at least in the same genre as yours. Choose someone who you view as being “successful” in marketing their books. Don’t copy everything your chosen mentors do; simply watch what they do and harvest ideas that make sense for you and your book. Try some out and evaluate what you try so you can stop doing anything that doesn’t work for you. Inspired by Gabriela, I have chosen two mentors who I view as more than marketing mentors for me, but more as lifestyle mentors. They are Joanna Penn and C. Hope Clark. Both of these authors have several successful fiction books and they are running successful businesses which also help authors. Joanna’s thrillers are published under J.F. Penn and her website, thecreativepenn.com, helps authors with all aspects of writing, including marketing. She has several courses, books, and other content for free download and sale. Hope has written several successful mysteries and she runs fundsforwriters.com, which helps authors earn an income from, in addition to marketing books, freelancing, crowdfunding, grants, and other income-generating activities involving writing. Of course, I don’t want to be exactly like either of these women; I have to offer something unique. My model is writing historical fiction books and helping authors with book marketing, including the writing craft and editing insofar as this relates to the product part of book marketing. Watching what they do is helping to inspire me and is giving me ideas to tweak and use to promote myself and my own books. Who would be your ideal mentor? Please share as a comment below. Teresa LaBella is preparing to release Belonging, the third book in herher romance trilogy that begins in New York City with characters Alison Clarke and Darien McKenna and continues in small town Iowa. Teresa tapped experience building strategic, fund development and marketing plans as a consultant to write a business plan that includes an executive summary, target market description, and a budget and marketing action plan. Even with her marketing background, marketing books has been more difficult than Teresa had imagined. She’s found that the marketing climate for books is always changing; “The first time or two out are total experiments of trial and error. What works for one person may or may not work for someone else. A successful strategy today may not work tomorrow.” Teresa learns from her readers and loves getting the negative and positive feedback, which she incorporates into the product part of her book marketing. She also learns by talking to readers and other writers at book fairs, workshops, and conferences. Teresa has sold the most books at personal appearances and book signings. She said, “I scoped out locations and venues that have hosted book signings and asked to schedule a date and time for my event, offered to supply in-house signage and promote their hospitality via my website and social media platforms, and asked if their business would reciprocate. I have bookmarks printed with a QR code that links back to my website and distribute those bookmarks at book fairs, workshops, conferences, and locations where romance readers might be – libraries, salons, and specialty stores. Giveaways are great for a limited time to create urgency – 24 hours, tops. A Memorial Day giveaway of my first book on Amazon resulted in 1,000 downloads and a brief spike in sales. But Amazon doesn’t let the author capture the email addresses of the readers so the long term benefit isn’t there.” The only paid advertising Teresa has used was a Fiver campaign on Twitter which produced little, if any, results, and a Facebook post boost that reached a targeted audience of over 1,200 women age 35-65. For authors just completing their first book about to be published, Teresa offers this advice: “Whether you traditional or self-publish, you must market yourself and your books. I’ve read and heard from many disappointed authors who thought they didn’t have to worry about promotion and that publishers took care of marketing and sales. Wrong! Authors who self-publish and successfully market and sell books are attractive to traditional publishers because they have built and bring a fan base who will buy more books written by that author.” On the writing life in general, Teresa said, “We write because we must. Don’t let the daunting and baffling task of marketing your work prevent or discourage you from doing what you love.” Great advice; your definition of success as a writer isn’t required to be to sell millions of books. Though marketing is usually necessary to sell books, selling books isn’t a prerequisite to being a writer. Get the writing done now, and worry about marketing later. Description: Sparks fly and desire ignites between reluctant lovers who got burned when they looked for everlasting love with the wrong partners. Both Alison Clarke and Darien McKenna escaped into successful, high-profile careers – she as a self-employed business owner of a successful media consulting firm in Brooklyn and he as executive chef at an upscale restaurant in mid-town Manhattan. Can chemistry and shared delight in food, wine, and film bridge the age gap and resolve mutual reservations about their longed for happily-ever-after? Description: Successful New York City power couple Darien McKenna and Ali Clarke McKenna had everything – except enough time for each other. Tragedy on the eve of letting go shatters their happily-ever-after. Truth and consequences confronted along an uncharted path to a place in Iowa called Harmony leads to new life and love in the second novel of the “New Life in Love” trilogy. To learn more about Teresa and sign up for her mailing list, visit her website at www.storyteller30.com or like her Facebook page. If you’re on Twitter, you know there are a lot of people there. And it’s pretty easy to make connections; people will seem to follow you out of the blue. Of course, many times they are just hoping you will follow them back. Then there’s all of that clutter. How do you stand out in the noise and actually connect with readers? The Tao of Twitter by Mark Schaefer can help you with that. The Tao of Twitter not only gives general advice about using Twitter, but also provides an action plan to get Twitterized in 20 minutes a day. You can easily apply this advice to book marketing. On page 20, Mark says, “Twitter is about sharing content for humans, not search engines.” He advises linking to your blog posts so readers can find out more and see that you know what you’re talking about. He pushes “authentic helpfulness” above all, providing several examples of beneficial connections he’s made thanks to Twitter. Tao number two is to offer meaningful content, which means sharing and posting things that are helpful, entertaining, enlightening, interesting, or a combination. Do not just post ads to your own books. It’s not that you can never talk about your book on Twitter, but follow something like a 10:1 rule: for every promotional tweet, post ten helpful, entertaining, etc. tweets. Tao number three encourages authentic helpfulness. When you’re using Twitter, constantly be thinking about how you can provide value, right there on Twitter, but also offline and via other online avenues. For authors, think about how you can be authentically helpful to your readers. Once you have 20 or so followers, break up your 20 minutes throughout the day, retweeting things as they resonate with you and adding your own comments where you have real insight. You can also create lists to categorize those you’re following to make it easier to do this. Continue to delve into authentic helpfulness by retweeting, answering questions, and offering help. You can use Tweetdeck or Hootsuite to spread out your tweets and get the mobile app so you can work on Twitter during down times. Mark classifies you as a pro when you’ve hit 400 or more followers. When you get there, keep doing what your doing, continually striving for authentic helpfulness, experimenting, and building your lists. These are the basics of The Tao of Twitter. The book also contains other helpful advice and tips, such as holding Twitter chats and ways to @mention to make sure your tweets are seen. To find that out, you’ll have to check out the book yourself. Source: Schaefer, Mark. 2014. 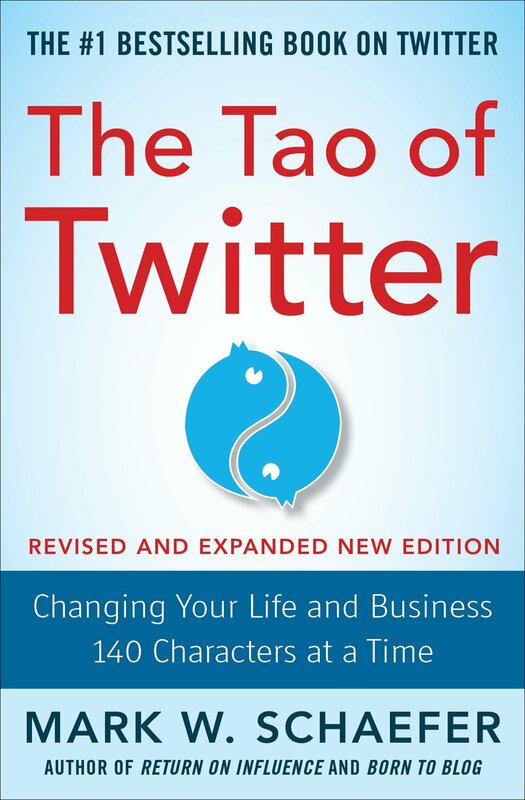 The Tao of Twitter, Revised and Expanded New Edition: Changing Your Life and Business 140 Characters at a Time. McGraw-Hill Education.